The best time to sell a soft-top car is when it’s lashing it down or cold. Apply the same thinking to bikes and the recent unsettled weather could be just what you need for a swift sale if you’re ready to advertise your bike (see BIKES FOR SALE for a fast and efficient way to book your ad online). The theory is that potential buyers think a soft-top car won’t sell in dodgy weather. So those who do go looking when storm clouds gather do so in the belief they must be in with a good chance of bagging a bargain. True or not, bad weather at least means potential buyers are less likely to be riding – giving them more time to be browsing for their next bike. And to give you all some inspiration, here’s some of the deals we’ve seen appearing on the site recently. More are being added every hour of the working day, so keep checking our BIKES FOR SALE section for the latest deals. Fancy a Caponord? We found a 2003 version in showroom condition with just 1700 miles on it with an asking price of £4500. Then there’s a 2000-mile ZZ-R600 as new at £4650. A 2003 CBR600 with just 800 miles on it is up for offer at £4500 in Hertford. And there’s a 2003 Z1000 with 2500 miles on for £5595? A 2003 Cagiva Raptor 1000 with 2300 miles on is being offered at £4250 and there’s a 2003 ZX-6R in High Wycombe with 5000 miles on, aclaimed dyno’d power figure of 110bhp at the rear wheel and a price of £4950. £4500 could get you a TT600 with 5800 miles on, too. Looking lower down the price scale? £2000 is the asking price on an 18,000 mile VFR750 in Cambridge. Similar money will get you a Bandit 600 on a P plate and 6000 miles on the clock. Scrape together £1750 and head for Wellingborough and you could return home with a Suzuki Freewind on a P-plate. It’s done 17,000 miles. 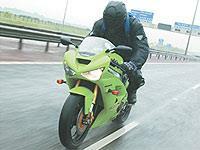 £1650 could land you a J-reg CBR600 in Luton. There’s loads more being added all the time. Go browse. Your dream bike could be waiting.